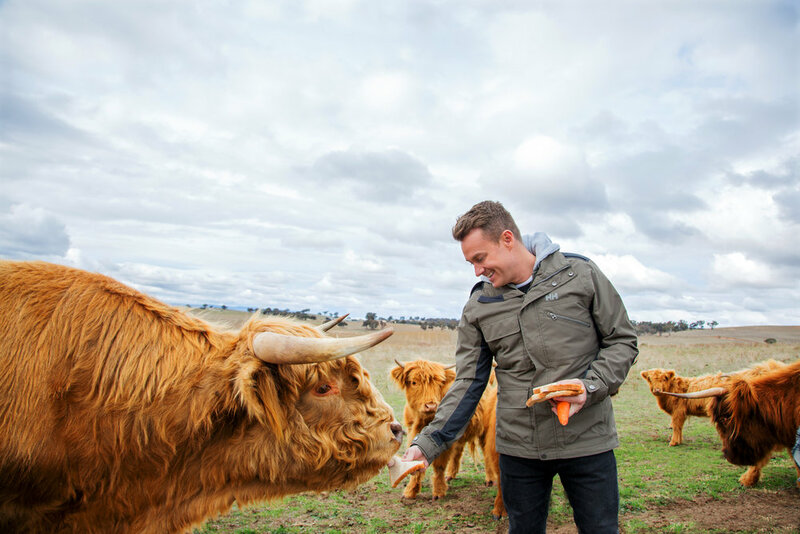 At the Denyer home, just outside Bathurst in New South Wales, the sight of the TV Presenter and Gold Logie winner Grant Denyer greeting us at the front door seems almost familiar. Aside from gracing our television screens since 1997, his genuine, down-to-earth demeanour tricks us into thinking we’ve rocked up at a mate’s. Chezzi, Grant’s wife and mother of their two girls Sailor, seven, and Scout, two, is equally hospitable — and real. The pair met when she was a producer on Channel Seven’s Sunrise, on which Grant was a presenter for 10 years. Last year Chezzi set up website Mummy Time, which features blogs, podcasts and a video series, all aimed at connecting mothers across Australia by sharing their stories of motherhood. In particular Chezzi focuses on perinatal depression and anxiety through her work with charity PANDA. The tree change to Bathurst nearly five years ago, meanwhile, has been a homecoming of sorts. 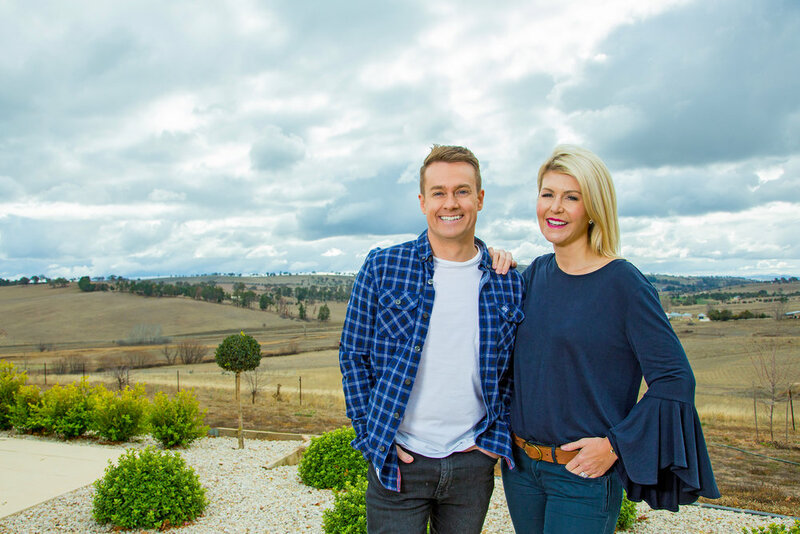 Growing up in regional communities, Chezzi was raised in a town called Fremantle, an hour outside Bathurst, while Grant spent his childhood in Avoca on the New South Wales Central Coast and on his family’s farm in Wagga Wagga, which they’ve kept for 110 years. “I split my time between the coast and a rural life — the ultimate for any kid — between a tiny little quiet hamlet on the sea and big, open wide spaces in the outback, where you learn to drive and round up sheep and you’re in the shearing shed,” says Grant. It’s also where he developed his passion and talent for motor racing. Starting off with a handmade go-kart at seven, riding tractors and eventually going on to enjoy a highly successful motoring career, Grant’s won a number of championships. And the plentiful trophies in his shed, Chezzi points out, represent only a quarter of what he’s won, with the rest stashed away in boxes. After marrying in 2010, the Denyers knew they’d one day settle in the country. With Grant frequently on the road for work and following Sailor’s birth, Chezzi wanted to be close to her family in Bathurst. “We were looking for about six months here around Bathurst and we finally found this place and fell in love with the view,” she says. Inside ‘Hyfield’, aside from a TV Week Logie Award sitting without fanfare on a hall table next to an oversized lamp, and framed memorabilia of Grant’s Dancing With The Stars win, the interiors are like any other home belonging to a young family. Large family photos line the hallways and plush runners provide cushioning for little feet as well as the family’s rust-coloured cavoodle, creatively named Princess Popping Popcorn (Popcorn for short) by the couple’s daughters. Like their dad, the girls love to ride motorbikes and relish nature-spotting expeditions with their parents — especially when it involves discovering some platypi at a local river. Last year Chezzi and Grant were ambassadors for Jeans for Genes Day, which both describe as a wonderful eye-opener to charity work. This year they actively sought out another charity close to their hearts. “We approached Rural Aid because it seemed like a perfect fit. We’re on the land, we know what it’s like to have no feed and to be struggling with drought,” says Chezzi. Grant says he was drawn to Rural Aid because of its simplicity. The Buy a Bale project allows people to donate a $20 bale of hay to a farming family so they can feed and hang on to their stock, giving them a chance to continue once the weather turns good. The Denyers are working with Rural Aid to devise a number of initiatives being released later in the year, including rescue programs to fix up farming houses in disrepair. “We’re going to one this weekend where the sewerage isn’t working and it’s leaking under the kitchen floor, so we’re going in with a team of volunteer tradespeople to fix it,” says Chezzi. The commuter lifestyle affords the couple the chance to be at home with their kids and still pursue the causes and work they are most passionate about. Grant’s daily breakfast radio stint on Sydney’s 2DayFM can be recorded either in the Sydney studios or from his own place. Grant will also be filming in Sydney in the coming months, when the biggest television set Network Ten has ever built is constructed for upcoming show Game of Games, which he is set to host. Now, with the addition of Mummy Time, Chezzi interviews all sorts of mothers in both city and country. “With the help of Rex, I’m able to head off in the morning, drop the kids off to school, interview mums throughout their day and then fly home and pick the kids up by the time they finish school. It’s amazing,” she says. Throughout their travels around the country, the Denyers are forever buoyed by the resilience of Aussies. Reporting on many natural disasters during his time on Sunrise, Grant says the Australian spirit is unbreakable. “Watching not just the human spirit but the Australian spirit when the chips are down — that never ceases to amaze me,” he says. These days, Chezzi says she and Grant are a lot more appreciative of a slower pace in the country. “Once I had kids, I realised I never really stopped to look around,” admits Grant.